You can bounce, slide, climb and shoot hoops in this inflatable! Definitely a super great option for super kids! 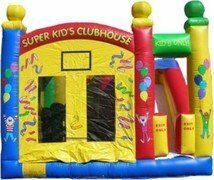 Great for small and large events due it's size and activities this bounce house offers.